How Many Push Ups Should I Do Before Bed? The pushup is a classic exercise for a reason: It's a full-body workout that engages several major muscle groups at once, including the hips, legs, arms, chest and core. Incorporating daily pushups into your fitness regimen can make you stronger, increase your metabolic rate and provide an instant energy boost. But how many pushups should you do, and will doing pushups before bed interfere with your sleep? To be on the safe side, leave a window of time between your nightly workout and bedtime. In terms of how many pushups you should do, it's important to listen to your body, start slow and never compromise your form: Everyone's ideal number is different. The number of pushups you should do before bed depends on your fitness level. If you're a beginner, five to 10 pushups is a good starting point until your strength and fitness levels improve. From there, focus on increasing your pushups over time (even from day to day or week to week) to successfully build muscle as you become stronger. Should I Exercise Before Bed? Will pushups before bed make you rested and ready for a good night's sleep, or will you end up feeling too energized to close your eyes? In an interview with Men's Journal, Dr. Jaspal Singh, a sleep specialist with Carolinas HealthCare System, explained that, while some physical movement before bed can actually help you sleep (simple yoga poses, for example), "The key to this is not to do sudden, rapid movements." This includes pushups. In WebMD, Dr. Stuart Quan, the Gerald E. McGinnis professor of sleep medicine at Harvard Medical School, echoes these sentiments. In the article, Quan recommends that, for those who want to get exercise before bed, it's important to wait a few hours between workout time and sleep time. This allows your body temperature to return to its regular 98.6 degrees and your adrenaline levels to stabilize. Just to be on the safe side, you could switch to doing your sweat session in the morning: According to the National Sleep Foundation, exercising too intensely at night can lead to interrupted sleep; rather, early morning workouts may provide the ideal blood pressure reduction and overall better sleep. According to Harvard Health Publishing, to find your ideal starting point for pushups, you should begin by doing just a few and see how many you can perform while keeping good form. This is important, because if you're not doing your pushups correctly, they won't be as useful as you're expecting them to be, and you could also risk injuring yourself. Keep in mind that you can always add more reps as your strength improves; there's no need to push it. 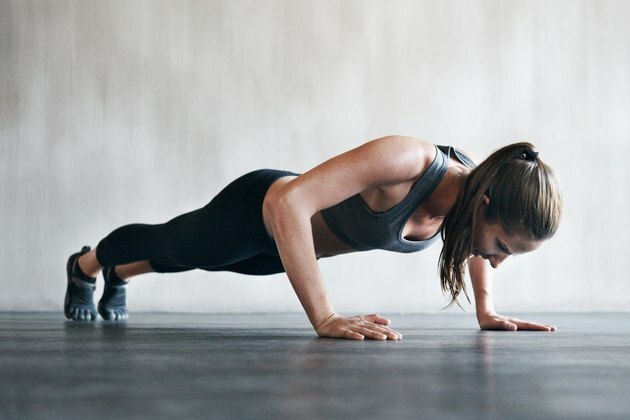 If you're a beginner, five to 10 pushups is a great starting point; over time, focus on increasing this number in order to gain muscle and get stronger. Read more: How Often Should I Do Push-Ups? Remember: It's important to have correct form and maintain proper posture when doing pushups; paying attention to this will help you determine the exact number of pushups that's right for you. When it comes to pushups and health, nailing your form is crucial. Performing pushups correctly is just as important as how many you do or what time of day you do them. Be sure to keep your back straight, keep your palms flat and just below shoulder level, and make sure that your weight is evenly distributed. Your core plays a huge role in this exercise, so focus on keeping your core engaged while keeping your back as flat as possible. Beginners should pause for a few seconds between consecutive pushups to avoid injuries and ensure that they stay in proper pushup position. WebMD: Can Exercising at Night Hurt Your Sleep?